Symbian phones are well known for their versatility for application support. Apart from just having vast application availability, there are also many modifications available to the software environment which lets you improve your phone performance and add additional features to it. But you will no be able to perform all these operations just with a newly bought Symbian. Nokia restricts users from having full access to its files which is required to implement some mods and install various applications. Hence the phone is needed to be Hacked. Well, there are many applications that can be installed by signing them with your personal key and certificate, but some applications may simply not work by this method. Till date the simplest method known to hack symbian phones was HelloOX, which is a small application that can automatically hack your phone in few easy steps. In recent times it is seen that many S60V5 and V3 phones became unhackable by HelloOX due to upgrade in firmware version. Users can easily find this out as HelloOx gets stuck in “Installing Root Certificates” stage. This was the situation with me having Nokia 5235. So here I will share another method to hack your phones which is actually flashing it. It sounds bit tough but believe me it is not so. First of all I would like to thanks Dailymobile forum members Oreo27 and Xlife18 for helping me out through the whole process. Now lets take a look at the things that you need to do before flashing your Nokia Phone. Your Phone model, software version and RM i.e RM- 588 in my case (*#0000#). Go to Dailymobile forum register there(free registration required for posting comments) and click Here to visit the thread. Search for your model and firmware version there on the first page, if you do not find it just leave a request and the thread main page will be updated within a day or sooner. As you get your model and version listed in the thread, download the file(uda) and save it for later reference. 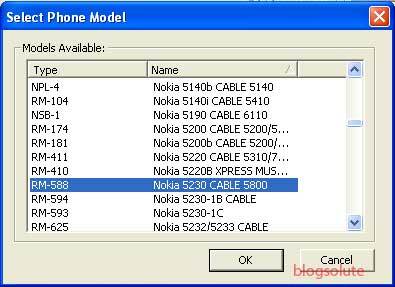 If you have nokia 5235 go for same version files of Nokia 5230 and so till the RM version is same. Visit the site Btusers and download the firmware version for your device selecting it by the RM version. This is an important step, select the version for your country else after flashing you may not find the appropriate language to work with. You may also find firmwares with same product ID for your region but one with 7 files and other with 8 files. You may download any one with them as they only differ in color variants. Files will be named as listed below( version will be according to your model). After you have downloaded all these files 50% of work is done. Now you have to download Jaf, Pkey emulator and latest INI files. These download links can be found in the forum main post. I had tried to use phoenix also but Jaf is much easier to use and worked fine for me. One thing you must note that Jaf works properly in Windows Xp, I have tried to work with it on Windows 7 but it did not work even in compatibility mode. So advance users can use Virtual Work station to install Xp or just use a friends computer with Xp on it if you are not much comfortable with Virtual Workstation. For people doing it on virtual windows, please do not minimize the virtual window and run Jaf because in doing so jaf will give error while starting. So press ALT+CTRL+ENTER to go to fullscreen then restart xp and start Jaf again. As you are done with installation of Jaf, install Nokia Pc suit in xp if you have not got it and connect your phone once so that the drivers get installed. Now replace the file “RM588_12.6.092_006_000_U001.uda.fpsx” with the file that was provided for your model in the forum. Just rename the file to the name given in the original firmware package and put all the files creating a folder RM-588, this will again differ according to your model RM. Create folders as given c:\program files\Nokia\Phoenix\products\RM-588. This RM-588 is the one you created in the previous step. Now run Jaf as instructed in the forum through the Pkey emulator, ignore any warning messages. Run Jaf in BB5 as it is used for flashing S60V3 and V5 phones. Tick on Manual Flash, Dead USB, remove tick from CRT 308 (else you will get IMEI back up error), then tick on use INI. Ticking on use INI will bring up a window from where you can select RM for your phone. After you have finished previous step click on Flash button on rght hand side, you will get a warning. At this point switch off your phone and connect it to the computer via usb cable then press ok. When the application says “searching for phone” press the power button of phone for half second. Well for nokia 5235 I have noted that the pressing time is bit more. If after pressing the power button nothing happens try altering the time of pressing, I had succeeded in this step after many tries. Once the Phone is found it will be automatically flashed. As the phone is flashed and you get Done message from Jaf, open the cable and take out phone battery, then restart again. Your phone will start like the first time. Now You need to copy these two patches to E:\Patches(i.e create Patches foder in root of memory card) and then go to Menu-> Apps-> Installed apps->RomPatcher+. When you open rompatcher+ you will find two patches i.e Install Server RP+ and Open4All RP+, double tap on them and they will be enabled and turn to green. Install Server RP+ patch is for installing unsigned applications and Open4All RP+ patch is to access phone system folders i.e c:\sys\bin. You can also download Rompatcher2.3+ and install it. Then from options add the patches to auto, this will enable you to automatically patch phone on every restart, if it do not work you can do it manually after every restart. After this your phone is totally hacked. Note: I have tested this on Nokia 5235 and I have done the exact same things as above. If you find any trouble or difficulty in performing these steps please ask here or in the forum thread. Taking any steps without understanding may leave your phone dead forever. Go through all the comments in the forum thread to get clear understanding of problems and their solutions that other people had. Damn Excellent Guide.. will reblog it for sure. dont u have it for Nokia 5800 XM?? Yes, it is applicable to all S60V5 and V3 handsets. Just go through the post, I have mentioned every thing. And particularly for 5800XM, yes you can hack it as well using this technique. Check out the given forum link for the version of firmware you are using. ERROR: Cannot get ATR from JCOP simulator! Please can anybody tell me the solution for this problem i need it urgently. Did you copy the 2 patch files in memory card as given in the article? Did you copy the latest INI file as given in the forum, Just download the INI file given in the forum link and replace it in JAF folder, so that it supports your phone. Thanks for replying so fast. This is the forum link to download INI file right ? See it works or not. I forgot the exact INI that I used coz I did it few weeks back. If downloading INI from this thread do not work then I will upload the INI I used..
is coming,why is it not able to recognize the files? what exactly is the problem? I tried to do that again, with tick only on manual flash and dead flash with CRT 308 unticked.This is what I get…. Put this in C:\Program Files\ODEON\JAF , It should work becoz i am using same settings and same steps as mentioned here. Have you replaced the .uda file ? If you have all steps correctly and still getting error, register in the forum and ask this question in the thread. People there are very helpful and will give you a probable solution. why did you copy it here “RM-588 under E:\backup\ppgms\nokiagames\newhacking”. did you copy it in “c:\program files\nokia\phoenix\products\RM-588”. Only difference I used PKEY emulater v4, hope this does not make any difference, you can try once with v4. i did copied to C:\Program Files\Nokia\Phoenix\products\RM-588, i will try with emulator v4 later, i didnt mean its a waste of time, i am just saying that i might be doing some thing wrong regarding the procedure, your article is of gr8 help..
Ok, If your next try fails, try reinstalling JAF, coz your JAF is failing to recognize the files. Or you can add me to your gtalk so that I can assist you during the process. I can understand how bad and impatient you must be feeling. I will try my best to help. Gtalk ID- sourojit258@gmail.com , inform me once after you add me. Well hacking a phone and hacking a computer both are totally different topics. Hacking your own phone gives you freedom to bypass some restrictions and that does not harm others. But hacking a computer stands itself in a broad category to talk about. You can search these things in google to get more information. is it a problem because i have got and downloaded 7 file out of 8 u hv suggested above? I also got the exact same error as yours while using Phoenix. That is why I recommended using JAF. And you have to download either of the firmware with 7 or one with 8 files(not downloading 7 files out of 8). I have downloaded the one with 7 files. Please use JAF it takes a minute to flash and upgrade with hacked firmware. update: You can download the latest firmware for nokia 5230 i.e 21.0.004, and get the hacked uda from forum. This works well on 5235 and also has smooth performance. I did it last night and it works fine. hi. i want to hack nokia 5530 RM_504 firmware v31.0.005. so please help me. V 10.0.021)? I hope somebody can help me. Thanks. I have bought a Nokia 5235 recently with Firmware version 12.6.092 and RM 588. I want to hack.Which version should I opt for.I tried it with the latest firmware for 5230 by following ur footsteps using Jaf.everything goes well till the part when it says Searching for phone. I press the power button and switch on the phone then it says “:phone not found.I went thru this for innumerable times and am getting really frustrated. what is wrong with my phone. Have you installed PC SUITE first? I had faced this problem initially with my 5235. So connect your phone to PC Suite first for all phone drivers to be installed on system. Where exactly did you put it in? when i am coping two paches \sis\bin in memory card then it shows acces denied.what i do please tell me someone.how i copy two patches \sis\bin folder in memory card? may be if you can give me the link to download latest INI file or any suggestion would be very help full. How to unhack the phone??? Just restart the phone or disable the patches..
Now i found it but it says can´t detect flashing server. is there any different method because my friend did this and his phone is bricked & dead is there any safer way to hack. @arya: The easiest way is to use helloOX but it dosent work with latest firmwares..
Hello, I’ve got a Nokia 5235 and I’ve done everything but after the first boot I go into applications menu and the RoomPtcher is missing, as it never was installed and I’ve replaced the .uda file. Please help! Sory my bad english. Hi Sourojit, your explanation seems very detailed and user friendly even if a bit scary for noobies. I’ll try it, thanks for the hard job. LOL.. Ya do not perform any action without being confident. I’m on Three Australia and they don’t upgrade the firmware since 300.21.012 – E71 Product Code: 0578048 RM-407. I’m really really disappointed by Nokia they adopted an anti competitive tactic move like the one we see on the DVDs (regions), they limited language option also they do not give any support regarding it. You know Australia is maybe the biggest multicultural country in the world but what Nokia did in the 20 century? They restricted languages options not to say the short usb cable is just an insult to consumers! I read somewhere that it could be possible to change product code to another country RM 346 the Hong Kong or Singaporean one since they have English and Chinese languages but then there could be incompatibilities between firmware and hardware, what is your point? So i have a SE vivaz (U5).. what do i do?.. It doesn show any RM….??? can i use this process for nokia c6-00 RM-612?? hey. People. PPPPLLLLEEEAAASSSEEEE!!! Help me with registration on recommanded website. They said “An Error Has Occurred! Firmware-022.014 dated 05.07.2011 with latest update dt-20.08.2011. I am unable to hack the phone with Helloox 2.11, as the phone does not go beyond ‘Moving installer..’ even after 15 minutes. In this my model number is nokia 5235 where as here it is showing 5238.
do I need to update my device software.